Throughout my years in cycling advocacy, I gained an understanding about how external factors such as budget funding, design guidelines, inspiration from other cities, and partnerships with residents, businesses, schools, and community groups can influence road safety improvements. 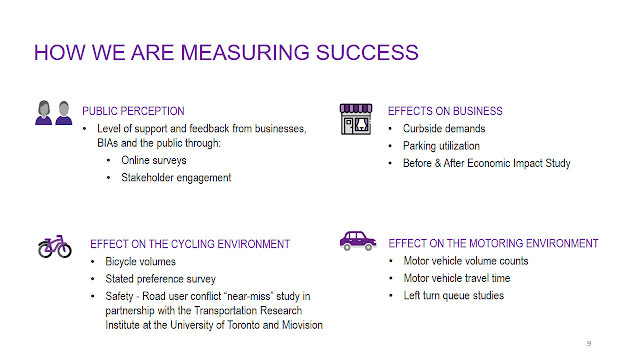 Another area Toronto must improve on is data collection in determining how effective cycling projects are. During the Winter Cycling Congress in Montréal (see recap and Montréal cycling posts), I attended their “A Matter of Data” workshop to learn about data collection in Anchorage, Montréal, and Ottawa. Andrew Ooms of Kittleson & Associates discussed cycling data collection from Anchorage and Fairbanks in Alaska. Sixteen bicycle counters can be found on two of Anchorage’s trails. More specifically, infrared counters mounted to poles, which also track pedestrians but do not get covered in snow unlike conventional counters. Fairbanks did not have permanent counters; instead relying on manual counts which used to be done by volunteers and staff, but now use Miovision cameras. One advantage of manual counts is additional information can be collected such as helmet use. However, Anchorage and Fairbanks do not currently provide transportation statistics via their open data systems. Ooms also worked with the National Cooperative Highway Research Program (NCHRP) to develop Report 797; the “Guidebook on Pedestrian and Bicycle Volume Data Collection”. The report revealed several challenges involving collecting non-motorized vehicle data. Pedestrians and cyclists are a lot closer together, whereas motor vehicles tend to stick within their lanes and are further apart. Pedestrians and cyclists are fewer in North American cities and are more sensitive to external conditions; resulting in variability of up to 40%! The report walked through how to establish pedestrian and cycling count programs, different technologies, and case studies in various cities. Eco-Counter – a Congress sponsor – was used in all three cities for data collection. Eco-Counter’s Jean-François Rheault and McGill University’s David Beitel of McGill University provided the Montréal perspective of Eco-Counter. Per Rheault, Montréal has twenty counters with the first installed in 2007. Certain findings consistent with other cities include bike paths being busier during the week with peaks during rush hour. The data revealed more cycling routes lead to core paths such as Maisonneuve experiencing reduced usage, while introducing full snow removal on Rachel Street in 2016 increased its winter usage. One issue Montréal has is only 11% of their cyclists bike year round, compared to 15% for Ottawa and 34% for Calgary. Montréal’s winter closure of BIXI also didn’t help matters. Beitel explained the use of a correction factor to account for temperature, rain, and snow. A correction factor of greater than one indicated favourable cycling conditions. The model has been proven to be accurate in predicting cycling volumes relative to weather. To end his talk, Beitel recalled the 1998 ice storm, which saw three million people – almost half of Québec – lose power and roads were transformed into skating rinks. Alex de Vries of Ottawa’s Citizens for Safe Cycling kicked off his presentation by asking what route cyclists use. 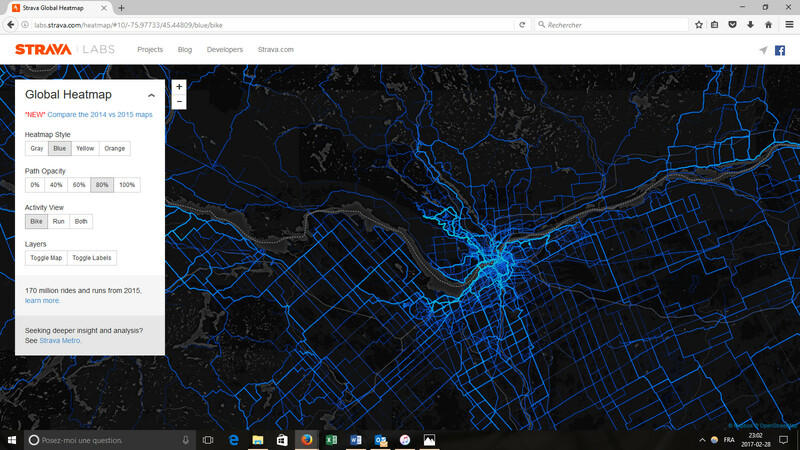 Not only did he bring up Ottawa’s thirteen Eco-Counter locations – the corresponding data is released quarterly – he discussed how it differs from Strava. Strava captures cyclists’ actual routing via voluntary participation, whereas counters only capture cyclists who pass through specific locations. Data collected via Strava – which cities can purchase via Strava Metro – is more racer oriented with 78% of users being men and a median distance of 16.1 kilometres from January 2015 to September 2016. Strava can be relevant in determining winter cycling routes; given the Strava participation ratio is two to ten percent during the winter compared to only one to four percent during the summer. On the Ottawa River Pathway trail – the most popular in Ottawa – zero bike counts are recorded in winter due to snow cover; leading to the Strava participation ratio exceeding 100%. About half of the counters (seven) are used on winter maintained routes. Toronto doesn’t have any permanent bike counters nor counter displays; instead conducting temporary counts with pneumatic tubes. Per Toronto’s Open Data system, only five to ten locations annually get bicycle counts with the last large scale count done in 2010. Like in Fairbanks, Toronto uses Miovision cameras to track bicycle counts on Bloor Street; itself subject to rigorous collection of other metrics. (see graphic below) Preliminary data was released on February 24, 2017 to inform operational improvements; stating a 36% increase in cyclists and 63% of motorists claiming increased comfort driving next to cyclists. The next evaluation will happen in June, though an extension may be needed for more reliable data. Toronto’s Cycling Unit should learn from cities like Anchorage, Montréal, and Ottawa by installing permanent bicycle counters. They should also look at different technologies such as infrared or maybe even adapt overhead detection at College and Shaw to count bicycles?